...that I recently commissioned artwork to commemorate the epic battle with Skoulos! The art was by the Fraim Bros (http://www.brosfraim.com), 11x17 pencil and ink for $125. These are the same Heroes of Punjar that I had inked after finishing Thrones of Punjar! 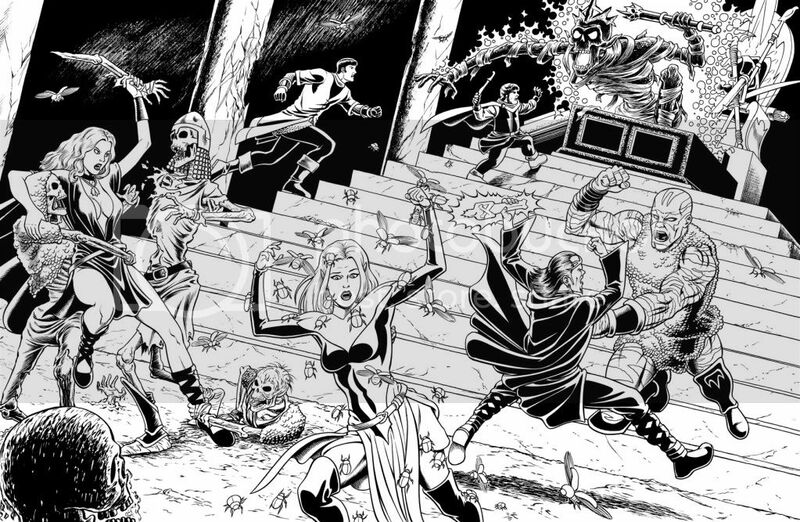 I have so many DCC adventures waiting for me to run them (including this one) that other folks have time to get illustrations made of their running the adventure! Glad to hear (and see!) that it was a good one! That's awesome! Glad you enjoyed it that much. That's really sweet artwork. Very "old school" in feel! Nice! That is seriously sweet. The lich came out awesome. They did indeed make it out alive...barely. It was a very tense moment for all involved! awesome art fraim bros! style is just like the old comic books! Logan: Are you Remy LeBeau? Remy LeBeau: Do I owe you money? Remy LeBeau: Then Remy LeBeau, I am.